These forest types are from The Nature Conservancy's Terrestrial Habitat Classification data. Beech-birch-maple forests, also known as northern hardwood forests, are typically dominated by sugar maple, yellow birch, American beech, eastern hemlock, and red spruce. 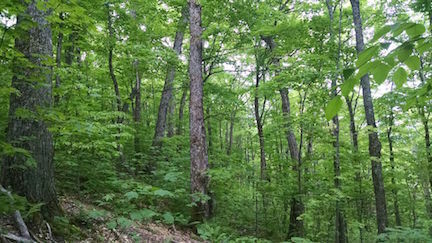 Northern hardwood forests occupy a range of environmental settings, including significant portions of the Berkshire and Taconic Mountains in western Massachusetts. The range in vulnerability for this community reflects this diversity of sites, with drier and lower elevation northern hardwood forests being more vulnerable to climate change impacts relative to higher elevation communities, particularly on north-facing slopes. Sugar maple is a common component of northern hardwood forests. In general, climate change is predicted to make Massachusetts less suitable for sugar maple. However, the individual site characteristics of a forest play a large role in determining its competitiveness in that forest. Cooler, moister sites, such as you would find on north-facing slopes, are likely to continue to provide appropriate conditions for sugar maple growth and reproduction in the future. Learn more about the impacts of climate change on sugar maple. Eastern hemlock and white ash are also important species in this community and both are threatened by introduced, invasive insects (the hemlock woolly adelgid and emerald ash borer, respectively).